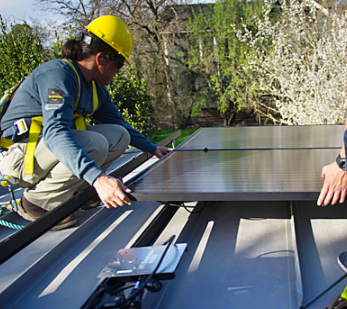 In House Designers Our consistent demand for quality in design and installation goes into our Solar Electric systems. We use in house designers for all of our installations. We don't approach your home with a cookie-cutter method that is identical to every customer. We design each individual system to your standards to ensure the most efficient and most attractive use of your solar panels. Some companies will simply install your panels where they think the panels should go. We consult with you in the design process and educate you on how your panels will be the most efficient. All components are UL certified and safety disconnects employed where needed. Metro Solar prefers to use micro inverters on all our installations. Micro inverters will allow the customer to view in real time what each solar panel in the system is producing.